I should not use the word “my” in front of breast cancer. It’s not my possession, I don’t want to own it. It is an enemy who has invaded my body. It has no right to be there. It’s an outsider, an intruder. A Facebook “friend” of mine sent me two books which detail natural alternatives to combat cancer. An important fact that leapt from the pages of both books is the discovery of Vitamin B17, which is found in apple seeds, and apricot seeds. So the old cliché an apple a day keeps the doctor away really has a deeper meaning: eat the entire apple. One book also describes one doctor’s battle with Sloan-Kettering Hospital, a cancer hospital in New York City. This man evidently stumbled upon the information that cancer can be combatted with foods, seeds, and herbs. The Hospital, in true Big Brother form, fired him. How can they make money if they can’t get cancer victims (another word I hate) to pay for all the surgery, chemo and radiation?! I then found out that the Plastic Surgeons had me on the schedule for the wrong procedure. They had me down for an implant. I would rather have nothing than an implant. I don’t need another alien in my body. I decided maybe this is a sign that I need to get a second opinion. (Ya think?) So I am scheduled for this coming Monday with a female oncologist that is also closer to home, which will make easier for Mr. Porter. Less racing up and down the Thruway to visit me. We also have bought a juicer, and I am doing 2 or 3 juices a day. I mix in all the goodies: dark green lettuce, blueberries, whole apple, some chia seeds and water. My body is having a rough time if I have three a day though; my stomach hurts all the way through the intestines. It might be a good thing; it might be cleaning out a bunch of stuff that shouldn’t be there. But it’s very uncomfortable. I can only read these books in short spurts; there is so much political and pharmaceutical profit-driven evil going on that my brain starts to spin. But there is nothing wrong with short spurts, that is also how I write! I may not be able to avoid the surgery this time around, but with all the prayers that are going up for me, and the nutrition information I am learning, I hope to never have to deal with cancer again! Sending hugs and prayers. Cancer picked the wrong chick to mess with, indeed. Get all your information, make your choices, and keep being you, because you are awesome. Thanks Anna. You are a great friend! Good to hear you’re slowing things down a bit, making time for that second opinion. Yes, I would think all the fiber from the juicing is cleaning you out, and it probably does hurt in all kinds of places. But keep at it. What happened with the genetic testing?Terre. Hey Terrel. I found out good news from the genetic testing. 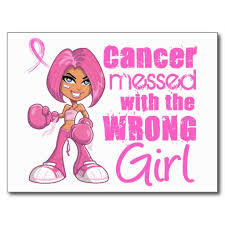 I do NOT have the “hereditary cancer gene.” So that is a huge YAY ! I am so glad you are getting a second opinion. will continue to pray for you! Thanks T. I found out several neighbors have gone to the “new” doctor I will be seeing on Monday and they loved her. So I’m hopeful. You’re in my prayers, sister! Keep on juicing…in a few weeks your system should start to get used to it. Thank you so much Courtney. It’s always nice of you to stop by!